This is where "within" meets "without", in a controlled and guarded way. 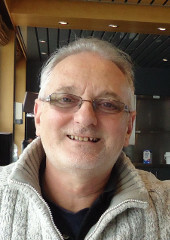 It is the resident's access to the world and the visitor's first impression. This makes it, structurally, the most complex part of the dwelling. The dwelling is intended to have a minimum possible impact on the planet. For this reason, it impinges on the planet's surface in only 6 small circular areas, each about 19·95 square metres to a maximum depth of only 1·44 metres. The Entrance Hall (one of the 6 ellipsoidal modules, of which the dwelling is composed) is shown on the right. The main floor of the dwelling is 3·588 metres above the surface of the planet. Entr­ance to the dwelling, at ground level, is via a motorized door, which is part of the shell wall. There is a lower floor in this module at ground level. People enter and leave the dwelling via this doorway. 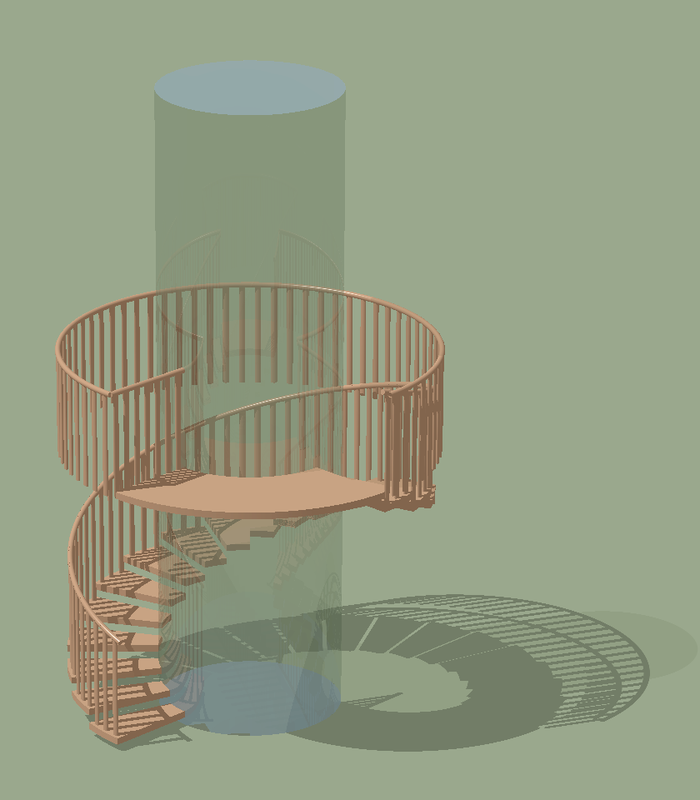 In the centre of the lower floor is a cylindrical lift shaft surrounded by a helical staircase, which makes a 270° turn around the lift shaft. 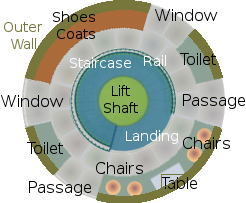 A cylindrical lift travels within the 2 metre diameter shaft, which ascends through a 4-metre diameter hole to the main floor of the Entrance Hall. A plan view of the upper floor of the entrance hall of the dwelling is shown on the left. The lift shaft and its surrounding helical staircase is at the centre. The floor surrounding the starecase is tiled with stone. Immediately in front of the exit from the staircase is an arc-shaped built-in ward­robe, where outdoor clothing and footwear are stored. At each side of the wardrobe is a window, beyond which is a toilet room at diametrically opposite sides of the staircase. The remaining arc forms a reception area with a table and chairs. A view of the lift-shaft and its encircling staircase is shown on the right. It is shown in complete isolation from the entrance hall module in which it is installed. Thus, the annular upper floor of the entrance hall, which surrounds the staircase, is not shown. The lift-shaft cylinder is shown in a transparent material such as glass. This is really just to make visible the path of the stairs as they pass behind the lift-shaft. 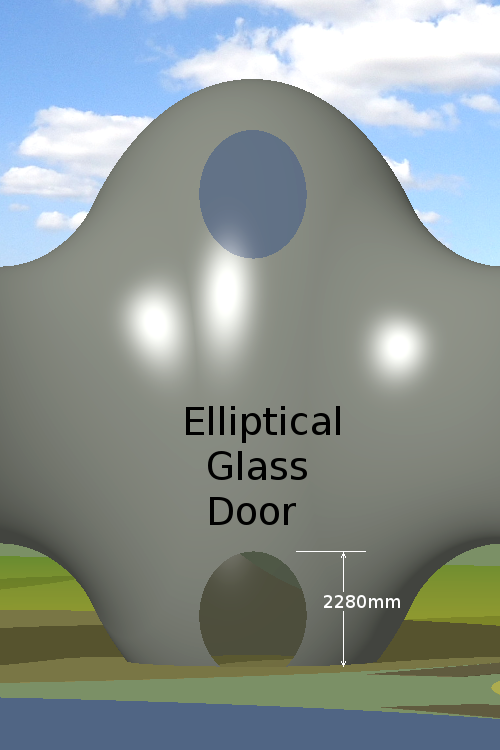 Nonetheless, glass could be a valid material for the lift-shaft. The staircase itself is illustrated in wood, although other suitable materials could be used, in­cluding glass. The staircase is viewed, in this illustra­tion, from the direction of the upper landing area. 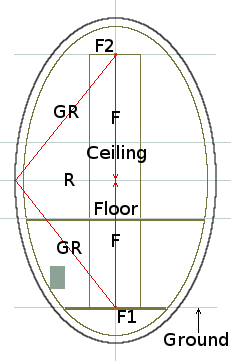 The arc-shaped wardrobe subtends an arc of 90°, which is a quarter of the circum­ference of the entrance hall. The radius of the entrance hall is 4 metres. The total width of the back of the wardrobe is therefore 2π × 4/4 = 6·283185307 metres, making the wardrobe as a whole a nominal 6 metres wide. The front of this curved built-in wardrobe is shown below. The wardrobe is for outside clothes and shoes, plus shoe cleaning facilities. It also contains clean indoor footwear left there when people go outside. Diametrically opposite the wardrobe is the reception waiting area. This also subtends a 90° arc of the entrance hall's wall. It contains a central low table flanked by two pairs of easy chairs. At each end of this arc are passages leading to the two adjacent modules of the dwelling, namely the Kitchen/Diner and the Lounge/Cinema. On the other sides of these passages are the two diametrically opposite toilet rooms.